So Lonely in Gorgeous: Running on Empty: September Empties! L'Occitane Citrus Verbena Shower Gel: Love this body wash and I'll always repurchase! 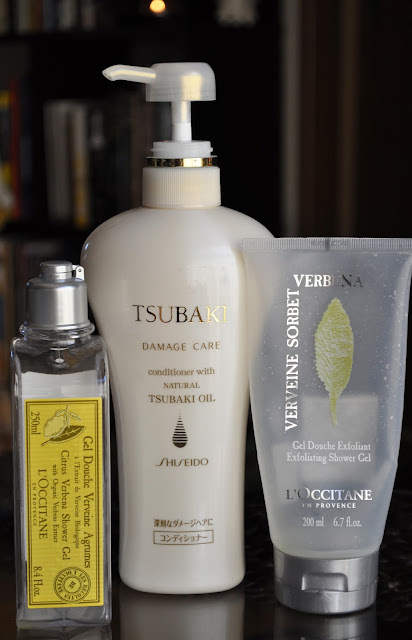 Shiseido Tsubaki Damage Care Conditioner: I used to swear by this product, but something has changed with the formula. Whenever I use this product my hair feels and looks extremely dry...curse the gods!! I want my Tsubaki back!! L'Occitane Sorbet Verbena Exfoliating Shower Gel: a refreshing shower gel that I wish wasn't limited edition, because I would definitely repurchase. Sebastian Laminates Gel: my curly hair need this product in it's life! Utena's Everish Charcoal and Walnut Facial Scrub: I love this exfoliator, and I will definitely repurchase! Skintimate Moisturizing Shave Gel: the only thing I will ever use to shave my legs. Enamel Remover: worst nail polish remover! So glad to be rid of it!! Supergoop Save Face SPF 35+ A.M. Moisturizer: I LOVE This moisturizer! I will be switching to Supergoop as my Morning moisturizer. I highly recommend this product! Bareminerals Active Cell Renewal Night Serum: Didn't care for this product. Wouldn't purchase a full size bottle. Benefit Badgal Lash: I used to own a full size of this mascara, and I have to say...I'm not a fan. Sorry, but wouldn't purchase. Smashbox Photo Finish Lid Primer: I like this primer, and I've been usng it for years, but it can be drying on the lids. If you have oily lids, you may want to try this primer. Shu Uemura Ultime8 sublime beauty cleansing oil : Ultime8 is a all-in-one cleansing oil that I'd purchase. Shu Uemura whitefficient clear brightening gentle cleansing oil: I'd purchase this cleanser, but probably use it in Spring as a Post-Winter boost. Shu Uemura cleansing beauty oil premium a/o advanced formula: a Summer time favorite and will repurchase. Dior Hydra Life Pro-Youth Eye Sorbet Creme: probably won't buy a full size jar of this eye creme. Garnier Nutritioniste Ultra-Life Pro Deep Wrinkle Cream: My skin didn't feel hydrated, wouldn't purchase. C.Booth Derma 24 Vitamin C Micro Delivery Facial Scrub: I really enjoyed this scrub. I'm believe it had a warming effect on the skin, but I can't remember...someone help me on that one. I'd buy this product. BareMinerals Purifying Facial Cleanser: This did nothing for my skin! Wouldn't purchase! I love using toothpaste and other products from home as well! I always come back with a suitcase load of goodies each time I visit home :D I have a September empties post coming up soon too. wow you really had a killer month! It's fun to look at what people empty but I really like knowing if you'd buy them again or not, it totally helps! I agree! It's great to find out if these products would be repurchased.